The “Must” of bergamot flavoured Teas, blend of Chinese black teas flavoured with bergamot.Especially selected by Compagnie Coloniale, this black tea is perfect for breakfast, along with milk. We love to be able to have our tea each morning be BIO. 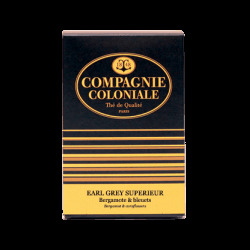 Un Earl Grey d'une grande finesse.